A famous author once trod the streets of the city where an old establishment promises patrons a warm welcome. According to legend, something truly horrendous happened in the building long ago, something that precipitated a haunting. But if you’re looking for a paranormal experience, you should check the ghost’s schedule. Each day, a new clue will be posted until someone names the location, providing the street address, city and state (or province/country if located outside the US) and an explanation as to how each clue applies to the location. If no one correctly names the location, the contest will end at midnight (Eastern time), Saturday, December 1, 2018. Please note, the contest ends at midnight in the Eastern Time Zone. If you live in a different time zone, please make adjustments so you will know what time it ends where you are. This is The Coopers Arms Pub, 10 St. Margaret’s Street, Rochester, Kent, England. The building dates back to the time of Richard I (1189-1199) and the first occupants were monks from nearby St. Andrews Priory. They were renowned for brewing ales and wine. After the dissolution of the monasteries (1536-1541), the building stood vacant until 1543, when it was opened as an inn and it has been in use ever since. 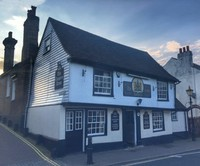 The pub specializes in cask ales and Kentish beers, along with the famous Black Sheep and London Pride Ales (both pale ales). Rochester is famous for its cathedral. The building dates to the 11th century, but the site has been a place of worship since 604 AD. One of the best clues was today’s Thought for the Day: “I have heard it said that as we keep our birthdays when we are alive, so the ghosts of dead people, who are not easy in their graves, keep the day they died upon.” – Charles Dickens. The author lived in Rochester for many years and people still see his spirit walking the streets every Christmas Eve night. The ghost at the Coopers Arms is a monk who was bricked up alive for some transgression. The spirit is seen only once a year – on a cold, dark night in the month of November. Congratulations, Jane. Now that you've named it, it seems easy. I was looking for somewhere in the US. Thank you April, Pat, Sam and others for your congratulations.